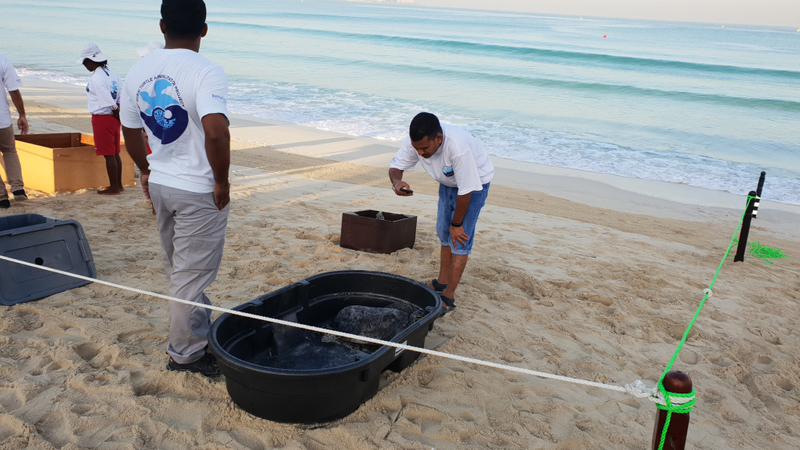 Fifty three rehabilitated turtles were released into the Arabian Gulf today. Dubai Turtle Rehabilitation Project was established in 2004. In the past 14 years, 1,653 turtles have been rehabilitated. 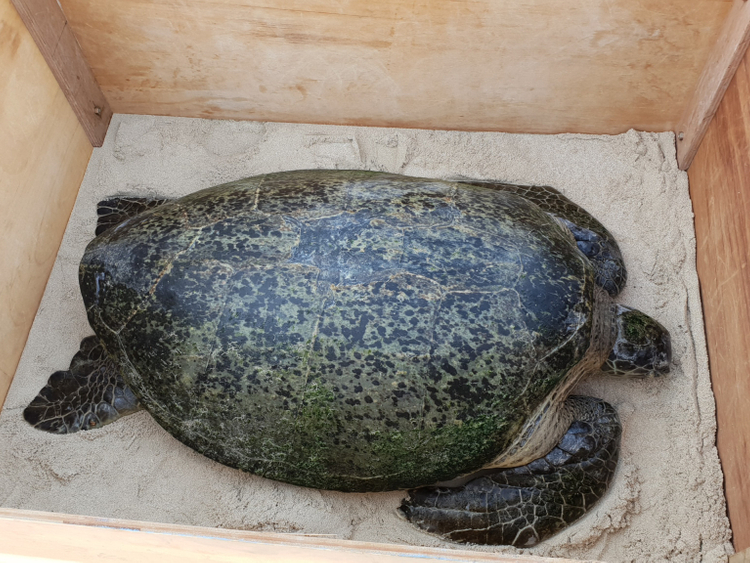 The turtles recover at Burj Al Arab and sent to Jumeirah Al Naseem for the final stages of rehabilitation. Dubai: He’s a 100-year-old warrior turtle and has 25 stitches to prove it. A member of the Green Sea species, he was having a leisurely day at sea when a boat crashed into him. And that would have been the end. But, the fighter was picked up by the Dubai Turtle Rehabilitation Project about six months’ ago. And he’s been recovering at the Burj Al Arab all summer. Today he was released back into the Arabian Gulf, along with 52 other rescued youngsters. The endangered Green Sea turtle weighing 110 kilograms is a major success story, especially as the World Wildlife Fund states that they are threatened by “overharvesting of their eggs, hunting of adults, being caught in fishing gear and loss of nesting beach sites”. 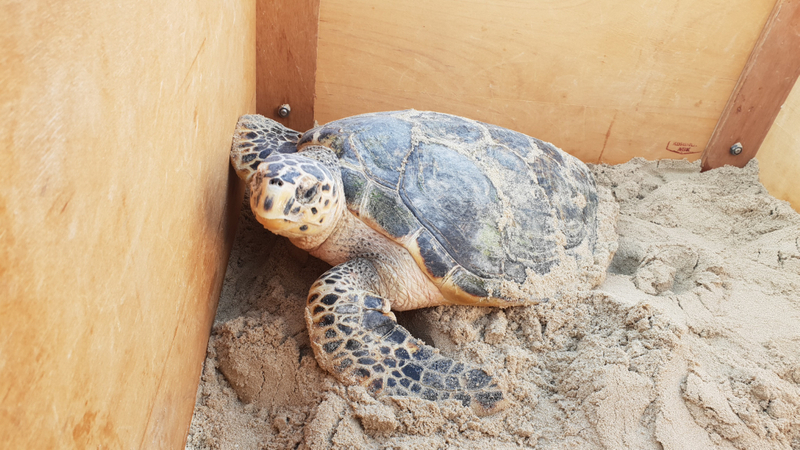 Among the sea-faring group of reptiles released today, there was a mixture of Green Sea and Hawksbill turtles, after spending time being rehabilitated at the Jumeirah Al Naseem. What is the Dubai Turtle Rehabilitation Project? The project was set up in 2004 under the patronage of Shaikh Mohammad Bin Rashid Al Maktoum, Vice-President and Prime Minister of the UAE and Ruler of Dubai. Their main goal is to rescue the region’s sea turtles that wash up on shore and get them well enough to go back into the wild. In the past 14 years, 1,653 turtles have been rehabilitated as part of the project and have been successfully released into the ocean. All of them are either injured or sick when found. It can take anywere between three months to three years for the rehabilitation process, depending on the condition of each turtle. Some of them are even satellite tagged, so their movement can be tracked over the years. However, none of the turtles released today had any tags, so the team will never know where they have gone. Where are they found off the coast of UAE? According to WWF, the Green Sea turtles are one of the largest of their Family and the only herbivore among the Class. This is why they are commonly found close to the sea grass beds near Jebel Ali, as stated by Baverstock. Hawksbills on the other hand feed on sea anemones, a group of marine, predatory animals, and jellyfish. But, they are a fundamental link in maintaining the health of coral reefs and sea grass beds. Therefore, they are also potentially found in the same area around Dubai.